This expressive ruby hued Pinot Noir has black cherry and wild berry aromas that are elegantly balanced by cedar notes. Generous black raspberry and mulberry with hints of baking spices evolve on the palate finishing with silky tannins that express the coastal terroir. Pleasantly pungent in ripe damson plum, this Pinot has lovely acidity, giving it a spicy mouthfeel around firmly present tannins. Full-bodied midpalate, the wine mellows through to the finish, ending in juicy fruit and earth. — V.B. Well-defined, ripe-cherry fruit is met in the nose by a nice dollop of sweet oak and hints of stony soil spice, and the same is true of the like-minded flavors that follow, but in both cases, the wine holds back just a bit owing to its very obvious youth, and it winds up for now on the firmer side of the varietal spectrum. That, however, is certain to change over time, and we are eager to see what awaits once it has had a chance to soften and smooth. Elegantly flavored (strawberry, cherry, raspberry, with vanilla and oak), full bodied, and balanced; a Pinot Noir with very good balance and a long finish. Excellent quality. 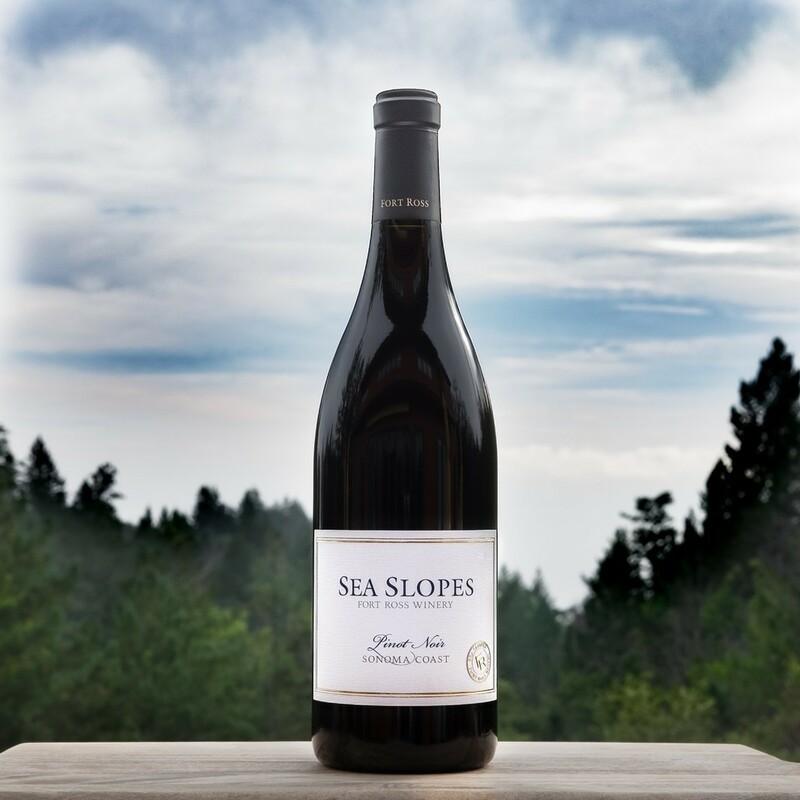 Our Sea Slopes Pinot Noir is blended for earlier release and is ready to enjoy sooner than our other Fort Ross Vineyard Pinot Noirs. This expressive ruby hued Pinot Noir has black cherry and wild berry aromas that are elegantly balanced by cedar notes. Generous black raspberry and mulberry with hints of baking spices evolve on the palate finishing with silky tannins that express the coastal terroir. From our mountain vineyard that overlooks the Sonoma Coast and now part of the new Fort Ross-Seaview American Viticultural Area, Fort Ross Vineyard & Winery produces limited quantities of single vineyard, Estate grown, cool-climate Pinot Noir, Chardonnay and Pinotage. With spectacular views of the Pacific Ocean less than one mile away, the vineyard is divided into 30 separate blocks, one-half to two acres in size, that rapidly fall from 1700 down to 1200 feet above sea level. Owners, Lester and Linda Schwartz and their small crew began preparing the 50 acre vineyard in 1994. It took them 4 years of preparation before they could begin planting the first vines in 1998. The 2012 vintage got off to a very slow start. It was cold and wet throughout the spring so the buds did not swell until surprisingly late in the season. As budbreak was so late, the weather was generally warm and stable during bloom – except for one worrying rainy day that did not affect the crop – only our composure. With such a late start to the vintage, there was less time left to ripen the grapes so we dropped a fair amount of fruit early on so that each vine would have less fruit to ripen and the harvest would not stretch on into inclement weather. The season veered between cold and extreme heat. We harvested when the weather was cooler and we were very satisfied with the quality of the fruit. Jeff Pisoni. The grapes for this Pinot Noir were handpicked during the cool hours of the night in 2 gallon trays. After hand sorting, the fruit was cold soaked for several days and fermented in a combination of 5 and 10 ton tanks. The caps were punched down 1 or 2 times per day, depending on the stage of the fermentation. The wines were then barreled in a combination of 4% new and 96% neutral French oak. Throughout the 10 months of barrel aging, the clones and different vineyard lots were kept separate to maintain their distinct flavor profiles and structural components as blending elements.